The session leader instructs everybody to take out a piece of paper and complete a task such as, “Draw a picture of the beach” (for example). Everyone in the session draws a picture of the beach. The session leader then goes around and marks some papers with a check plus or an A and other papers with a check minus or a C or D.
The message: We received high or low marks but didn’t know what was EXPECTED of us to receive that particular mark. Hence, OUR students need to be aware of the expectations by means of rubrics / checklists before a task is assigned and assessed. Do our students know the expectations before they begin an assignment / task / learning experience? Are they able to push themselves beyond the grade level expectation and know what to do to reach an above grade level descriptor? Are they ever a part of the process to create the rubric / checklist / expectations? There are numerous rubric making sites for teachers out there on the internet. 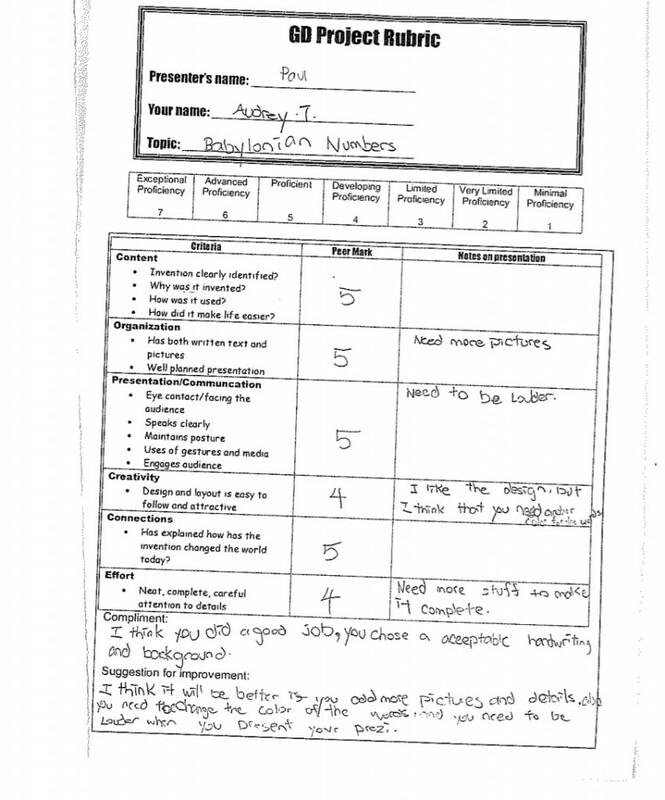 There are also many teachers that create rubrics with their students’s input. Is it fair to our students to assign a task without letting them know how it will be assessed? Even though traditionally, TEACHER assessment has been the only form of assessment in the classroom, SELF and PEER assessment have an important role to play in order for students to grow and progress. Students need to not only understand what kind of learner they are (Online tools to help students determine this) but also where they are in their learning journey. 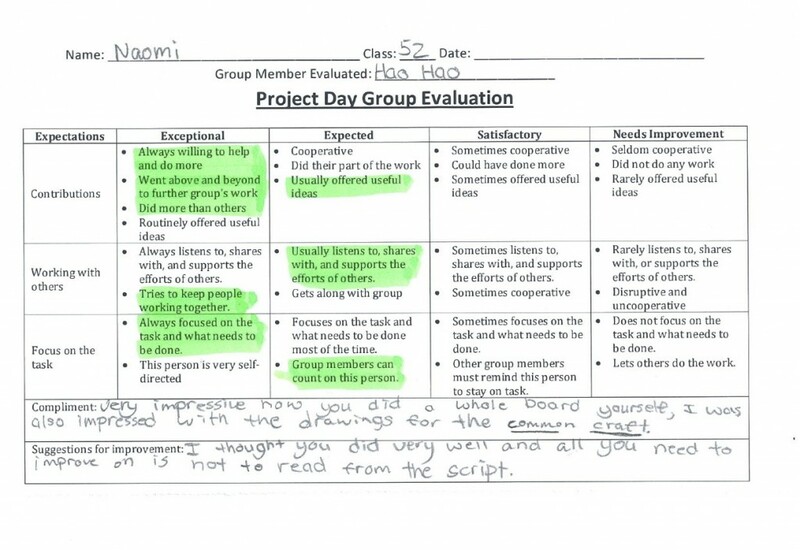 A few samples of peer assessment from my classroom. Don’t keep expectations a secret, allow your students to become aware of them and strive to not only reach them, but exceed them as well! This entry was posted in assessment, PD, unit of inquiry and tagged assessment, expectations, PD, peer assessment, rubrics, self assessment. Bookmark the permalink. As a person who now does PD for teachers, the beginning of your blog post really caught my attention. What you have said about making expectations and standards clear for students is so important. That was something I tried to do in my classroom with students, but now that I do PD for teachers, I don’t think I do that as much as I should. I think you inspired me to approach the way I facilitate PD in a slightly different way (I know that was not your goal … but I thought I would let you know … ). Thanks for writing this blog post! I agree with Melissa. Our district just adopted a new teacher evaluation system and in addition to your comments about expectations, I have become more aware of the need to align our objectives with our assessments. Why should our focus for learning by on culture if our assessments are on reading comprehension? Shouldn’t the two match?